No. 5, Jalan BA/3, Kawasan Perusahaan Bukit Angkat, 43000 Kajang, Selangor, Malaysia. V.A.B. Industries Sdn. Bhd. is a company involved mainly in industrial supply of products of die-cut parts, bonding & attachment solutions, ThinsulateTM and foam. We have wide range of products to fulfil customers’ requirements and expectations. We strive for excellence in all aspects of our operations. And, consistently, we deliver the best service and product quality to our customers. With strong technical knowledge, proven good service and many years of experience in the market, our company and business is growing rapidly. Now, we are building long term and solid relationships with many customers, especially the customers from the manufacturing sectors. 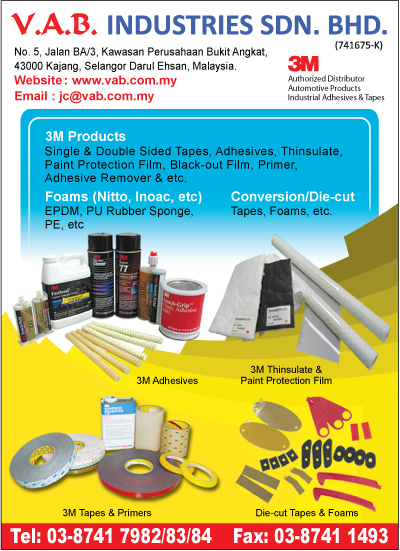 As an Authorized Distributor with 3M, the origin of the products is reliable and the products are assured genuine. Our customers will have worry-free about the quality of the products. Other brands of products: Nitto, Tesa, Inoac.